By Srinivas Chowdary Sunkara // petrobazaar // 2nd Oct 2018. Fuel oil prices across all major ports rose to its widest in at least three years in this week. Expected tightening of fuel oil supplies in Asia continued to underpin the sentiment. According to FIS, A total of 3 million tonnes - 3.5 million tonnes of Western fuel oil supplies are expected to arrive in Singapore this month, down from about 3.5 million tonnes - 4 million tonnes in September. Owing to its booming shale industry, the U.S is likely to become an important supplier of low-sulphur marine fuels ahead of major new emissions regulations in 2020, Vienna - based consultancy JBC Energy Said as published in FIS. 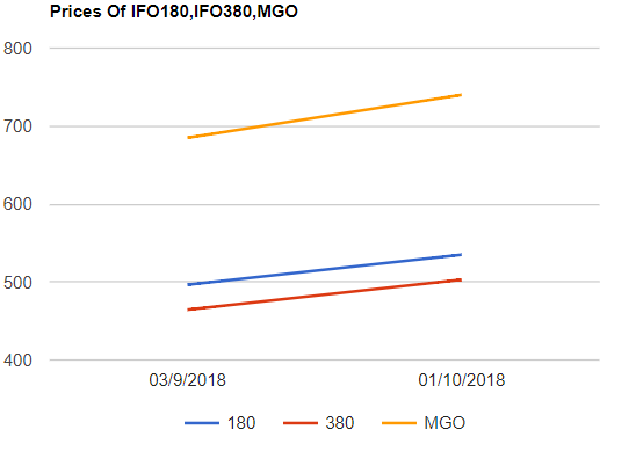 As predicted, Fuel oil, Furnace oil, Light diesel oil and Bitumen prices are revised up in Indian domestic market by all the oil marketing companies for the fortnight ended, Sep, 30th, followed by fuel oil and its crack price rally around all the ports.